Also included is an Introduction in which Paul provides a deep understanding of how to amaze your audiences and provides analogies from his years as a professional underground gambler. This Intro is a very, very informative treatise on how to make your spectators "look at you" with awe, respect, and laughter, and at the same time, "open up" their pocketbooks. 1) TRANSLATION - A spectator shuffles the deck. Then a hilarious routine ensues in which the performer removes cards from the deck after you ask four crazy questions. Then the spectator cuts the deck into four piles and all of the cards on top of each packet, matches the question cards. Easy to do, very interactive and hilarious! 2) YOU MUST BE LUCKY - The performer finds two Aces from a shuffled deck in a flourishy manner...but then the spectator finds the next two Aces in an even more remarkable manner. Here is an easy effect that makes the spectator the hero. Wait until you learn the easy-to-do sleight that makes this effect a real miracle. 3) GHOST COLLECTORS - Alright...this isn't the easiest trick to do - but it is a mind-bender. Three selections are signed and placed aside. The spectator picks four cards from the deck and they turn out to be the four Aces. The signed selections are then inserted into three different parts of the deck. The four Aces are waved over the deck and then in an eye-pleasing display, they trap the signed selections. Learn a really cool sleight of Paul's that has many uses and also learn a beautiful revelation/display by Stuart Gordon. 4) MAKE THE CARDS MATCH! - This self-working trick will make your spectators gasp. Martin Gardner said it was the "...finest of all mathematical card tricks!" This effect will even fool magicians and it is so easy to do! Combines card magic with a topological problem. 5) POKER MENTAL - This effect requires no sleights whatsoever and yet your spectators will think you are a master mentalist/card mechanic. The "workings" of this effect are brilliant. Your spectators will believe you to be possessed. This is a handling of a Frank Garcia trick. SHUFFLE-BORED - Paul provides his personal rendition of this brilliant, time-honored prediction effect by Simon Aronson. It is very easy to do and so strong, you can use it to close any show, from close-up to cabaret. When I found out Paul had a new ebook on Lybrary I couldn't wait to read it. 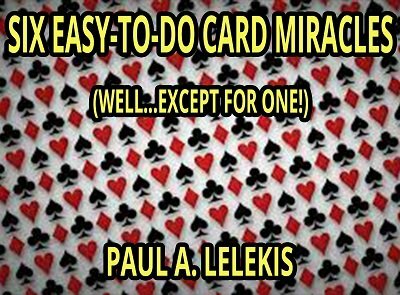 Paul Lelekis, as many of you know, is one of the very best card technicians on the planet. Aside from being so skillful, Paul is both a very good writer and shares invaluable advice based on years of real-world experiences. This latest, 'Six Easy-To-Do Card Miracles', is right up my alley.. Anything magical that's also easy was written specifically with me in mind. In all fairness, not every effect is what I term 'easy'. 'Ghost Collectors' and 'You Must Be Lucky' require a couple of manipulations that are easily within the scope of the average reader. The other four effects are darn close to self-working. In fact, 'Make the Cards Match' and 'Translation' are both of the Martin Garner variety that, when performed step by step, will work correctly even though we know not what we do.. Don't you love it when the magician is as impressed as his audience! Simon Aronson's 'Shuffle bored' is the last of the six effects. This version is based on Simon's 1980 version, with personal aspects added by Paul, along with explainations. This is one of my all-time favorite effects, on any level. The fact that it's self working is an added bonus. Paul begins this ebook with a treatise on performing effects for folks, particularly in a restaurant setting, that is alone worth the price of the ebook. He is absolutely right on with his observations, and I will always remember Paul telling of how his tips went up exponentially as he began to 'show off' less and 'show less'. Suddenly, his magic began to appear effortless and his audiences were more impressed by what they didn't see than by what they did. Priceless. Buy the ebook. Enjoy the effects. And you'll be a fan forever. Another book of winners! Thank you Paul for another wonderful contribution to the magic fraternity. The effects in Six Easy-To-Do Card Miracles are fun and easy to perform. Let's you focus on presentation which is what it's all about. The "Tips for Maximizing your performance" in the Introduction alone is are worth the price of the book! Something here for everyone and again, lots of great presentational possibilities. Enjoy Pauls' clean, clear relaxed writing style that is so easy to follow. The one thing I've noticed about Paul's effects can be summed up in two words..."They Work!" I'm sure you will agree...Enjoy! Paul Lelekis has done it again! Low price & great, do-able, entertaining magic. If you don't do "Poker Mental" this handling is a breeze and so easy to understand in Paul's easy to read writing style. Multiple card effects are taught for one low price. Advise on performance style & the bonus effect are gravy on top.